Don’t Miss Your Chance to Win a Year of Fair Trade Treats! World Fair Trade Day is coming up later this month. 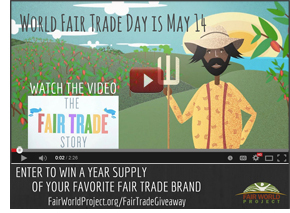 To celebrate, we will are releasing our new video The Fair Trade Story today. With the video, we are also launching a contest that will run all month. Just watch the video and choose your favorite brand to be entered to win a year’s supply of their products. Think chocolate from Alter Eco, body care products from Alaffia, coffee from Equal Exchange, grains and lentils from Farmer Direct, and lots more! Watch the video and enter to win now! Action Alert – Protect Poultry Workers! Sign the Petition to Tell Tyson to Be Fair To Poultry Workers! 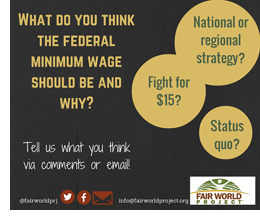 What Do You Think the Federal Minimum Wage Should Be? Did you notice our new Readers Speak feature in our print publication For a Better World? There has been a lot of talk about raising the minimum wage in over the last few months and for our Fall Readers Speaks, we want to hear from you. What do you think the federal minimum wage should be? You can send us an email or let us know via Facebook or Twitter. We look forward to reading what you think! A new initiative to reduce food waste launches. Support for the Transatlantic Trade and Investment Partnership (TTIP) plunges in both U.S. and Europe. Organic Consumers Association sues two infant formula makers over false organic claims.